We bring to you a video loop projection series from Luke Barcelona Cano. There's a series of seven sequences, as their titled, that were developed for BYOB London (Bring your own Beamer). BYOB is about finding artists with projected creations for one-night shows. 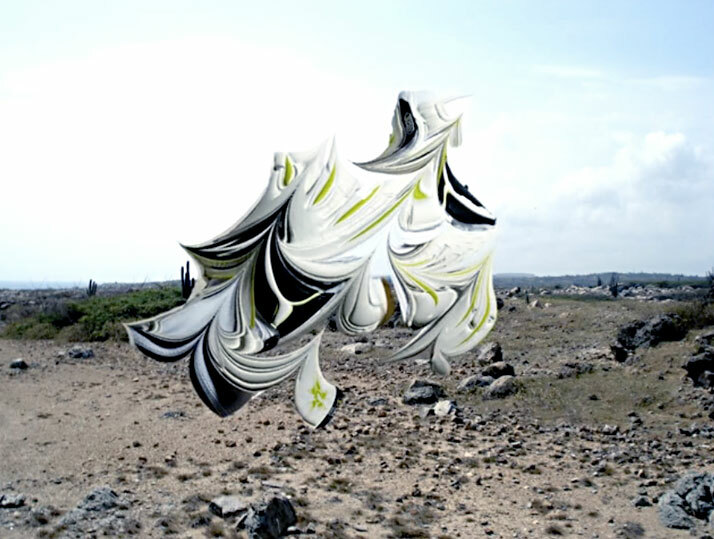 Re-renders by Luke Barcelona Cano take us all over the world with his video projections in a timeless solitude. A desert oasis fills the backdrop in one sequence (#2); calming our mind and focusing our thoughts as a blurred image moves seamlessly in place. The ripple affects fits perfectly against the hot pavement below, baking in the late afternoon sun. A hint of red within the blurry image starts to take shape, however not enough to clearly identify the image within. Sequence 06 has a much slower pace with the moving colors pasted over a storm brewing in the backdrop. This tornado-like loop creates a three dimensional object that spins effortlessly and forever frozen in time. There is no presence of anyone here; just solitude. It's as if time stands still and all that matters is this coiling framework of an un-identifiable object. What does this place have to offer? What was it before? What will it become? There are endless questions we could pose; so much is left to imagination in these running video loops. Perhaps that's what makes these video monologues so successful; a natural fixed landscape is the framework for a digital, forever moving and changing display. It's a juxtaposition of unrelated elements; a marrying of unlike things that makes you scratch your head and wonder. This creates a conversation with the audience - perfect. There will automatically be questions, opinions, assumptions and wonders about these unique creations; emotions that will go on forever because, well, time is frozen and stands still.